Let’s cover some basics of selecting an appropriate long-range cartridge here. Between the old and proven standbys and the hot new kids on the block, today’s long-range shooter has nearly as many cartridges to choose from as they do guns. Not all are created equal; some really only shine in a limited range of applications. Too, some cartridges are best left on the dealer’s shelf. Assuming you have decided on a rifle model designed for long-range shooting, the next step is selecting a cartridge for that new shooting stick. Here there are some things that need to be addressed in making that decision. First off, looking at a list of possible cartridges, you will see huge differences between them. This includes recoil levels, price per round, basic working range applications, and even specific rifle types. Second, you’re not likely to find factory rifles chambered in some of the exotics. Buying a 6mm-284 over the counter or one in 7.82 Warbird is highly unlikely. Such rounds are mostly proprietary propositions, and that means custom rifles. Understand that the first rule in selecting a cartridge for long-range shooting is that more power and powder are required to get the job done. That means the big cartridges, such as the .300 Winchester Magnum or the 6mm-284 that is, of late, so popular, will push more bullet further with less drop at longer ranges. Take the .300 Winchester Magnum, for example. This .338 Winchester-based cartridge uses a .30-caliber bullet and is, without question, the most popular super long-range .30-caliber of all time. Army snipers like it, as do law enforcement units needing a tool that effectively punches out to tough targets. For the long-range sport shooter, the .300 Winchester Magnum is also king, because it can send heavy Very Low Drag (VLD) bullets to 1,000 yards against warm targets and still accurately hit the vitals. At the same time that you need more powder and bullet to shoot effectively at distance, you don’t want to overdo the recoil (nor overestimate your tolerance level for it). Shoot too much cartridge and you won’t shoot well—at all. Using the same .300 Winchester Magnum as an example, a sensitive shooter can quickly develop a flinch. Another thing to take into consideration is that big, high-power, long-range rifle shooting almost always requires a spotter at your side while you’re shooting. Recoil levels are so high that the target becomes a blurred-out image upon cartridge ignition. (Well, unless the target is so far away that the rifle and scope have time to settle down prior to the bullet’s impact. Believe me, that won’t happen very often, if ever.) Do you have a partner you can work with regularly? If not, you’re going to spend a lot of time walking or driving back and froth from bench to berm. What you need to do is select a maximum distance that works best in terms of a cartridge choice and generated recoil levels, then go to work learning everything you can about the performance of that given cartridge. Still too much to sort through? Try this. As long as I have been shooting long-range targets, I’ve tended to like cartridges like the .243 Winchester, .243 WSSM (Winchester Super Short Magnum), the never-to-be-discarded .25-06 Remington (the best of the wildcats to go commercial), and the workhorse .308 Winchester. Learn any one of these cartridges well and you will do some serious damage to some very long-range targets. They will send bullets to long ranges and do so without the massive recoil that can cause shooter fatigue. If you must have more, on the high-recoil and -energy end of things, I do shoot the 7mm Remington Magnum in a Ruger No. 1, as well as a .50 BMG upon occasion, but with far less frequency than other rifle/cartridge choices—the reasons should be obvious. The final rule about cartridge choice is to stay within your means. By moving to some exotic caliber in a full custom rifle, you’re going to have to pay a good deal more per round (and that after the high cost of the rifle), sent downrange in every case. You can shoot a whole lot more .22-250 or .25-06 than you can 6mm-284 or even a .300 Winchester Magnum for a given amount of money. 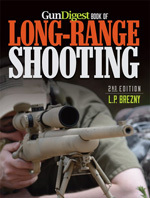 Editor’s Note: This article is an excerpt from the Gun Digest Book of Long-Range Shooting, 2nd Edition.